Provided photo Lehman Catholic High School’s 2018 Homecoming Court includes, front row, left to right: Jacquie Schemmel, New Bremen; Shannon Staley, Piqua; Grace Monnin, Piqua; Claire Larger, Fort Loramie; Lauren Riley, Sidney; Samantha Edwards, Sidney; Grace Olding, Sidney. Back row, left to right: Michael Denning, Sidney; Elliott Gilardi, Troy; Ethan Knapke, Piqua; Elias Bezy, Sidney; Mitchell Sollmann, Sidney; Bradly Haynes, Sidney; Alex Gleason, Sidney. 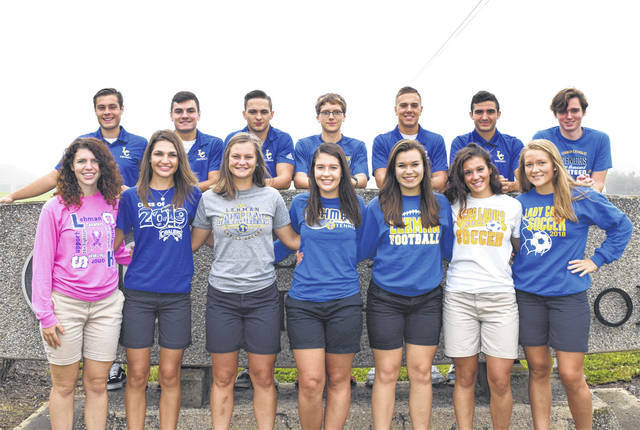 SIDNEY — Lehman Catholic High School will celebrate homecoming Oct. 11-13. Festivities begin Thursday at 8:15 p.m. with the traditional bonfire and pep rally. On Friday, alumni, family and friends are invited to Sidney Memorial Stadium for the homecoming parade at 6:15 p.m. The parade will feature each class at Lehman Catholic, Principal/CEO Denise Stauffer, Homecoming Grand Marshall Leah Bertke, and the homecoming king and queen candidates. Selected by the senior class., Bertke has been teaching at Lehman since 2014; she teaches chemistry, integrated science, AP biology, and food science. She is also the moderator of the Interact Club and Pro-Life Guards, assists as a coach of the Science Olympiad Team, coordinates the Senior Kairos Retreat, and has organized the summer mission trips and the 2019 trip to Europe. Each member of the Homecoming court will be introduced during pre-game ceremonies, followed by crowning of the queen and king. After the parade, the alumni band will join the student band for pre-game, followed by the national anthem performed by the Lehman Catholic Limelighters and Gold Standard A Cappella Groups. The football game between Lehman and Upper Scioto Valley High School begins at 7 p.m. There will be a special halftime salute to the coaches and players who were part of the Volleyball State Runner-Up and Championship teams from 1993, 1998, 2000, 2002, 2005 and 2010. The weekend concludes at the Disney-themed homecoming dance at 8:30 p.m. Saturday at the high school. https://www.dailycall.com/wp-content/uploads/sites/30/2018/10/web1_Lehman-Homecoming.jpgProvided photo Lehman Catholic High School’s 2018 Homecoming Court includes, front row, left to right: Jacquie Schemmel, New Bremen; Shannon Staley, Piqua; Grace Monnin, Piqua; Claire Larger, Fort Loramie; Lauren Riley, Sidney; Samantha Edwards, Sidney; Grace Olding, Sidney. Back row, left to right: Michael Denning, Sidney; Elliott Gilardi, Troy; Ethan Knapke, Piqua; Elias Bezy, Sidney; Mitchell Sollmann, Sidney; Bradly Haynes, Sidney; Alex Gleason, Sidney.